I am under the impression its cold, rainy, snowy or some mix of the three everywhere right now causing many of us to want to hibernate. Hibernation makes me think of cupcakes. I wanted something bright and yellow and cheery to make my lazy drabby day improve and so I decided to bake lemon cupcakes- always cheery. I can’t think of a better way to enjoy lemons on a winter day seeing as how lemonade sounds ridiculous. But lemon-y cake with homemade lemon curd infused frosting and a little dollop of the lip-puckering stuff…that sounds delicious. And exactly what can turn a dismal day around. The first step is the curd, which is somthing creamy, sweet, and citrusy. Just like clementine curd its very versatile – you need not feel you aren’t going to use it for other things. It’s not difficult to make, but can also be found in the stores where you find jelly and jam. The cupcakes are simple. I make them a smidgen more difficult by making a graham cracker bottom layer. Please please please try baking them before making another cake by box mix. There is no reason to unless you want funfetti cake, which I have yet to figure out a homemade version of. Frosting is as easy as making a cake so I’m not going to go there. Get out your mixer and oven mitts. In a medium bowl, beat egg yolks and eggs. In a saucepan, combine butter,sugar, juice, zest and salt. Cook on medium-high for 1 to 2 minutes, stirring occasionally until slightly thickened. Whisking eggs vigourously, add a small amount of the butter-lemon mixture. Add remaining butter-lemon mixutre in small increments until combined. Return to saucepan and reduce heat to low. Whisk until thickened and coats back of spoon. Transfer to a bowl or tupperware making sure curd is covered tightly. Refrigerate overnight. Pre-heat oven to 350 degrees. Line cupcake pan with paper liners. Combine graham cracker crumbs, sugar and melted butter. Stir until well combined, then press about 1 tablespoon on the bottom of each cupcake liner. Cream butter and sugar until fluffy, about 5 minutes. Add eggs, 1 at a time and the lemon zest. Sift together the flour, baking powder, baking soda, and salt in a bowl. In another bowl, combine the lemon juice, lemon curd, buttermilk and vanilla. Add the flour and the buttermilk alternately to the batter, beginning and ending with the flour. Pour batter into cupcake tins, about 2/3 full. Bake for 20-30 minutes or until cake tester comes out clean. Combine butter, 1 1/2 cups of the confectioners’ sugar, milk, vanilla and lemon curd and mix on low speed gradually moving up to medium speed. Add confectioners’ sugar by 1/2 cups until spreading consistency is reached. 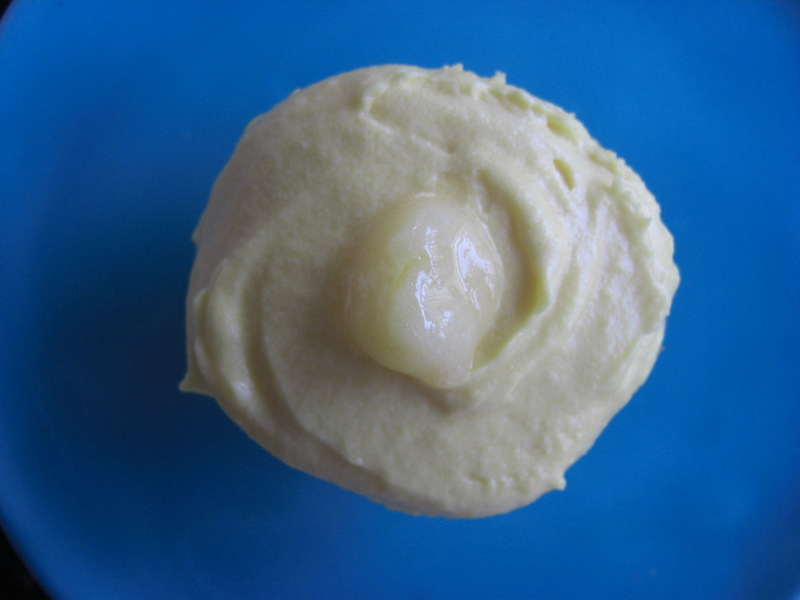 Frost each cupcake and place a small dollop – about a teaspoon of lemon curd atop. Pucker up! 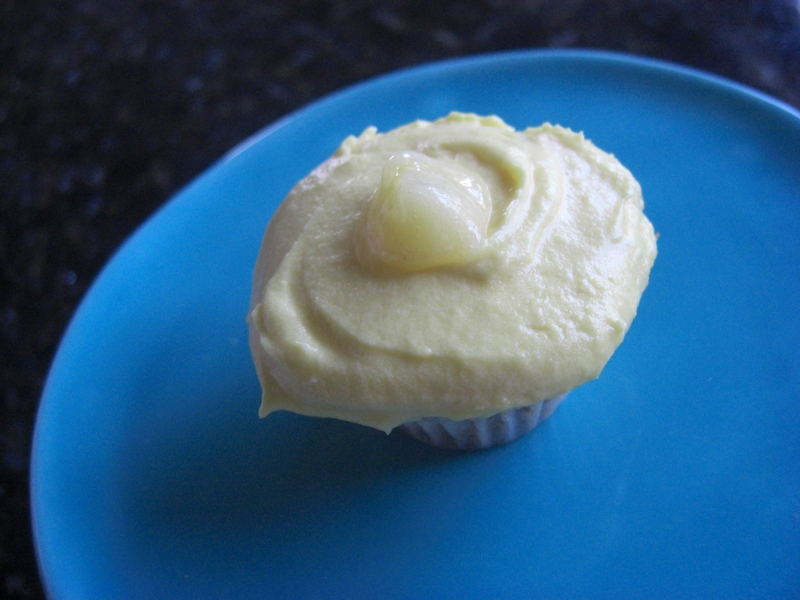 * You can also save the lemon curd until the cupcakes are done, and place curd into a piping bag. 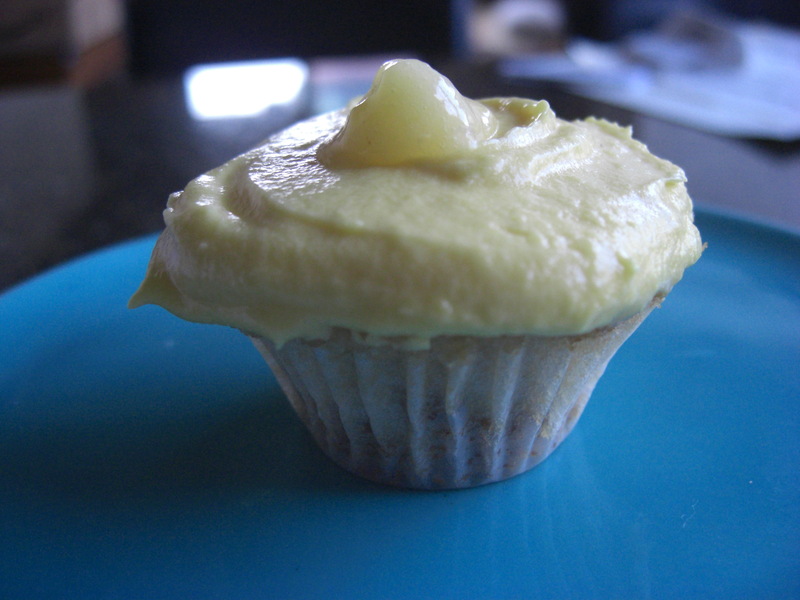 With a small/medium round tip attachement, insert tip into baked (cooled) cupcake and squeeze about 1 teaspoon into cupcake. Repeat with remaining cupcakes, then frost.